We had a full room and nearly an hour of great questions following the presentation. Branding is an integral part of our marketing strategy from our shirts, pit and robot to our online presence. Our unique name, iconic logo, and bright orange and green colors identify us as Exploding Bacon, wherever we go. 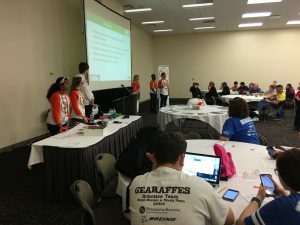 Team 1902, Exploding Bacon, was the 2013 World Championship Kamen Family Imagery Award and placed in the top 4 teams for the Digital Media Award in 2014. Bacon has also been the winner of 4 Regional Imagery Awards. 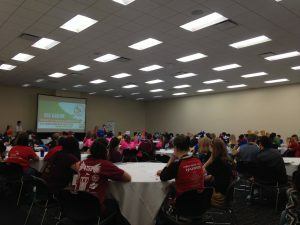 The Big Bacon Theory of Image & Marketing presentation was put together years ago from our lessons learned on marketing our team for a workshop for the FIRST World Championships in St. Louis and Houston on how to effectively market a FIRST team. The team has given this presentation 26 times, 8 of those at World Championships, in many different venues, and here is where you can find all of the information presented in these workshops. Did you use any of the information in a presentation? What do you wish you would have seen more of? Did you use this information in a presentation? Did you see our presentation at a workshop?